In June 2012, President Obama's executive order enforcing parts of the Dream Act and the Supreme Court's decision to block components of Arizona's draconian immigration law propelled the immigration debate back into the headlines once again. Based on oral histories, individual testimonies, and years of research into the lives of ordinary migrants, Living "Illegal" offers richly textured "stories that often get lost in the rhetoric" (Gainesville Sun)--of real people working, building families, and enriching their communities even as the political climate has grown increasingly hostile. Moving far beyond stock images and conventional explanations, Living "Illegal" challenges our assumptions about why immigrants come to the United States, where they settle, and how they have adapted to the often confusing patchwork of local immigration ordinances. This revealing narrative takes us into Southern churches, onto the streets of major American cities, into the fields of Florida, and back and forth across different national boundaries--from Brazil to Mexico and Guatemala. A new preface by the authors frames these stories in light of recent policy developments, as well as the 2012 elections and possible shifts ahead. 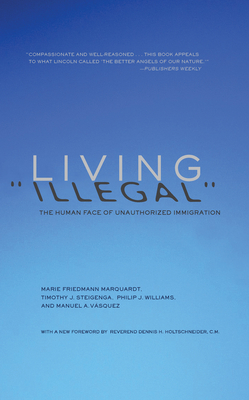 An unmistakably relevant, deeply humane book, Living "Illegal" will continue to stand as an authoritative guide as we address one of the most pressing issues of our time. Marie Friedmann Marquardt teaches religious studies and sociology at Agnes Scott College in Decatur, Georgia. Timothy J. Steigenga is a professor of political science at Florida Atlantic University in Jupiter, Florida. Philip J. Williams is the director of the Center for Latin American Studies at the University of Florida. Manuel A. Vasquez is an associate professor of religion at the University of Florida in Gainesville, Florida. "[C]ompassionate and well-reasoned . . . this book appeals to what Lincoln called 'the better angels of our nature.'" "[T]imely . . . a thoughtful volume that contains serious and humane suggestions for reform." "A uniquely nuanced and human view of the unauthorized immigrants at the heart of the immigration debate." "Provides persuasive and compelling answers to all the tough questions we need to address." "Immigration reform has a human face. . . . This study clearly brings this to the fore and should be on the reading list of all those who . . . are interested in the immigration issue."